Can you spot Green Bay Packers QB Aaron Rodgers in this photo? Can you spot Green Bay Packers QB Aaron Rodgers in the photo above? OK. Here’s a hint: He’s not wearing his normal uniform. Another hint: He’s wearing a fake beard. 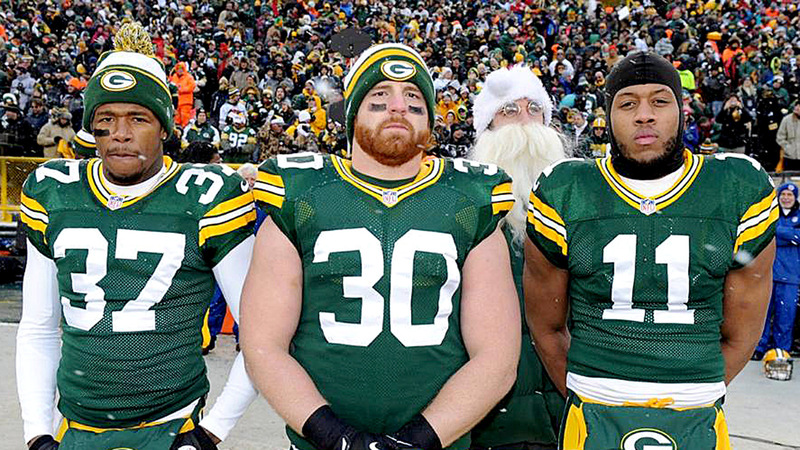 Yup, that’s Rodgers in the back with a Santa Claus hat and beard on. The injured QB had a little fun before the Steelers-Packers game at Lambeau on Sunday. Then his team went out and lost 38-31 on another snowy afternoon in Green Bay. This isn’t the first time he’s photobombed teammates before a game. Check out the tumblr Aaron Rodgers Photobombs for more awesome examples.